Everyone that loves to sew will want to stitch this vintage sewing notions themed quilt. 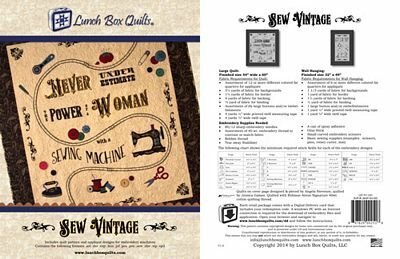 The Sew Vintage collection includes 29 machine embroidery appliqué and embroidery designs. Included with the designs are pattern instructions to make a large quilt or wall hanging. Pattern includes redemption code for digital delivery. Embroidery designs in the following formats: ART, DST, EXP, HUS, JEF, PCS, PES, SEW, SHV, VIP, and VP3. For more accuracy use Mark-a-Block template set, Item #MBSV1. Measuring Tape - Twill tape shown see item TWC058- (available in White or Natural).